Complete Line – The category for complete lines, or complete production lines or complete packaging lines, is somewhat misleading. The complete line category refers to a series of machines that are producing in sequence in a single production line. Because complete line machines are running together, the machines have been integrated to work with one another. However, Frain has extensive knowledge in regard to selecting and integrating individual machines into a complete line for an application. 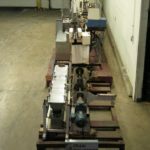 When creating a complete line for individual machines, careful attention must be paid to the transfer of product and packages from one machine and process to another machine and process. Frain has engineered services that are capable of integrating the various machines together into a complete line including the product and package transfers between machines and processes. Bartelt Model IM714 / IM6, complete, automatic, intermittent motion, horizontal form, fill, seal and cartoning line rated from 20 to 60 pouches per minute – depending on materials and application. Line Consists of Bartelt horizontal form, fill, seal machine with 14 stations, set on 7" centers, Pouch size range of: 2" to 5-3/4" in Length; 2" to 9-1/2" in Height; with maximum thickness of 2". Auger powder filler, no pouch / no fill, dust collection hood, vacuum pick-off, digital temperature controls and safety guarding. Bartlet cartoner, 2 chain unit set on 6" centers with 1-1/2" high square lugs, carton size range: 1/2" to 2" in Length; 3/4" to 3-1/2" in Width; 1/2" to 3-1/2"in Depth with proper change parts. Equipped with 84" long product in feed conveyor with 4-3/4" long x 3" wide x 7/8 "high fixed buckets, 8 station 4-1/2" long x 4" wide x 24" high rotary carousel, blank carton magazine, 2 vacuum suction cup pick n place, no product / no carton sensor, Equipped with 96" long product infeed conveyor with 4-3/4" long x 3" wide x 7/8" high fixed product buckets, blank carton magazine with 2 vacuum suction cup, pic n place, single arm product ram, Nordson (2) gun H/M glue system, 20" L x 3" H carton compression section. with no product / no carton, both have Electro-cam PLS 6000 controller with touch pad and panel view. Mounted on heavy duty base frames. All Fill complete powder filling line capping and labeling line rated from 10 to 30 bottles per minute – depending on materials and application. Line consists of Terco 36" OD bottle unscrambler feeding into All Fill single head auger filler then into Kaps All model E spindle capper to Avery pressure sensative wrap around labeler and finally to Terco 36" OD accumulator. Mounted on base frames. OPTIONAL Enercon induction sealer available at an additional cost. Bartelt Model, Pre-made microwave popcorn bag or pouch filler and sealer with number of bags or pouches per minute – depending on materials and application. Line Consists of Bartelt horizontal form, fill, seal with dual lane magazine and (3) head rotary pick and place, bottom clip transport conveyor with 20 stations set on 7" centers, suction cup style pouch opener, dual volumetric popcorn feeders, twin Hibar pistons for dispensing oil, pre-heat seal bar, heat seal bars, and folding station. Filled and folded pouches are transferred onto a Campbell servo time belt system feeding into a Doboy J wrapper lugged in feed conveyor that will wrap registered film around the filled and folded microwave popcorn bags. The bags will transfer onto a belt check weigher, and then through a metal detector. Optional hand load hot melt cartoner available at additional cost. Bartelt Model, Pre-made microwave popcorn bag or pouch filler and sealer with number of bags per minute – depending on materials and application. Line consists of Bartelt form fill seal equipped with dual lane magazine with (3) head rotary pick and place, bottom clip transport conveyor with 20 stations set on 7" centers, suction cup style pouch opener, dual volumetric popcorn feeders, twin Hibar pistons for dispensing oil, pre-heat seal bar, heat seal bars, and folding station. Filled and folded pouches are transferred onto a Campbell servo time belt system feeding into a Doboy J wrapper lugged in feed conveyor that will wrap registered film around the filled and folded microwave popcorn bags. The bags will transfer onto a belt check weigher, and then through a metal detector. Tindall complete 2-1/2 gallon, stainless steel, ice cream processing, mixing, filling and lidding line rated 50 to 400 gallons of ice cream per hour, at 22 Deg F. Line speed are based on output of the KMLT340 (3) barrel ice cream freezer. Also has a CP Model S-420 ingredients mixer with Eriez dry ingredient feeder and a Tindall 2-/12 gallon ice cream container filler and lidder. Ingredients filler and mixing units work in conjuction with the freezer to accurately, and evenly meter ingredients into viscous liquid product stream such as fruits, nuts (the ingredient), ice cream (the product) from a continous ice cream freezer, which in turn can be used with the Tindall 2-1/2 gallon filler lidder, which is mounted on caster for easy movement in / out of production areas nad has direct a hookup to the continous freezers and can run products such as ice cream, sherbert, varigrated ice cream, and ice cream with fruit and nuts. Last running 2-1/2 gallon compsite ice cream container. Groninger Model KFVG211A, complete vial washing sterilizing, filling, stoppering and aluminum crimping system with number of vials per minute – depending on materials and application. Vial diameter: 10mm to 100mm and 30mm to 200mm in Height. Fill volume: 3ml to 270ml. Stopper size: 13mm to 28mm all with proper change parts. Line consists of all Groninger machines starting with Model FSA tray in feed conveyor to worm screw, star wheel indexing into Model ASV100, 12 station rotary vial washer with siliconization to Groninger Model STS 3226L depyrogenation tunnel oven with14" wide x up to 10" high aperture x 105" long tunnel with belt width of 12-1/2" and sections that evenly heat, sterilize, cool and depyrogenizes vials with low pressure pre filters and high presuure Hepa filters. Groninger Model KFVG 211A monoblock system has a filler with (4) dosing stations currently set up for (2), bottom up fill and no container / no fill, has stopper inserter and aluminum crimp capper with 16" OD stopper and aluminum cap vibratory bowl feeders, automatic rejection system for no stopper / no cap detection and 204" long x 2-1/2" wide vial discharge plastic flex link belt conveyor. (3) Control panels (1) main and (2) onboard have filtration, ventilation, air velocity, heating, cooling, slicone, sterilizing, bowl feed, filling, stoppering, crimping and conveyor controls with digtial readouts, chart recorder and start, stop, e-stop push buttons. All machines mounted on stainless steel base frames. Kalish Monocount, complete tablet / capsule packaging line rated from 5 to 40 bottles per minute – depending on materials and application. Line consists of Kalisort 150 bulk bottle unscrambler with elevator, Kalish pharmaveyor in feed with backup eye, Swiftlift bulk tablet feeder / elevator, Kalish (3) tray 12 track counter. Standard tablet diameter range is 2.5mm to 22mm unit can go to 1" (with proper change parts.) Kalish Model 120 cottoner can handle lengths from 2 to 9", inverted U with multiple stroke insertion capability and set up for either cotton or rayon. Kalish push thru capper with air track cap feed (set for 38mm) push thru cap placement and final torque station, fed by 24" diameter cap feed bowl. 8 cu ft stainles steel cap hopper with level sensor. Kalish bandit neck / body bander w/heat tunnel, Enercon induction sealer and all interconnected conveyor. Line is configured in a U shape with all inter connecting conveyor. Merrill, complete integrated, in line, tablet or capsule packaging line rated from 50 to 120 bottles per minute – depending on materials, application and capsule or tablets count. Line consists of Kalish Auto Sort bulk plastic bottle unscramber with bulk container elevator, feeding into a Merrill 72-16AH slat counter (16"wide x 72" slats), Garvens model S bottle checkweigher, Lakso 300 cottoner, Resina UN40 capper, Pillar UNIFOILER induction sealer, PDC 75M neck bander, Axon shrink tunnel, Labelette APS 106 pressure sensitive wrap around labeler. Line is being quoted set to one size container/pack pattern, with a factory acceptance test at Frain Industries facility. Klockner Hansella, complete weighing, dissolving, rotary vacuum cooking and forming system rated from 300 kg’s to 1000 kg’s of product per hour – depending on materials and application. Can be used for hard candy, hard candy with center fillings, soft caramels, jelly and chewy candy products. Line consists Rotomat continous roto cooking system which is a crystal free dissolving, pre cooking and vacuum cooking system for sugar water glucose slurry with continuous steam heat, holding tank and transfer pumps and a downstream Caramaster for the caramelisation process. Strada forming system for continuous production of formed sweets (unfilled, highly filled liquid) laminated for hard candy, chewy candy, toffee, eclairs production of unfilled up to highly filled quality candy with 15mm to 180mm per hour rope speeds, Consisting of batch roller with (6) stainless steel conical, ribbed rollers measuring 72" Long x 4" Diameter at base and, 1-1/2" Diameter at tip and is used to shape product into a 4 roller rope stringer system for precise centering of the filling mass within the sugar rope through the roller head of the rope sizing machine, to rope cutter and then to the cooling tunnel with chiller and air handling system.